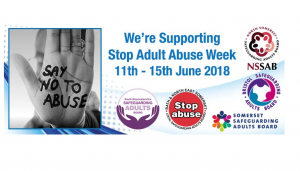 This week is Stop Adult Abuse Week, a local initiative to focus attention on safeguarding. Pass on the message, ‘if in any doubt, speak out’. If you are worried that an adult who is unable to protect themselves is being abused or neglected, call us on 01454 868007 to talk it through (In an emergency please ring 999). Something may just not feel quite right, or could seem a bit out of the ordinary. You don’t need to know the full picture, but you can help us to build it.